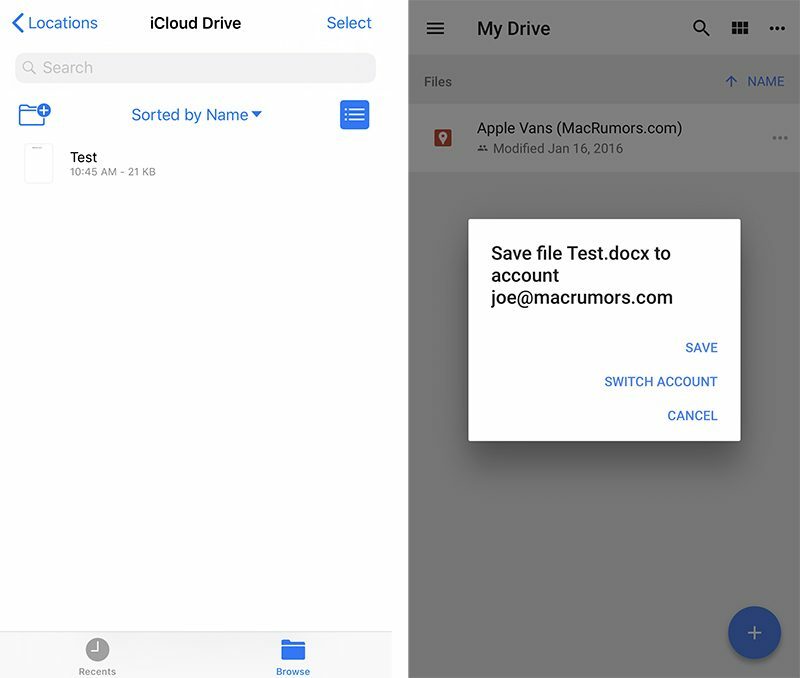 Since the Google Drive app for iOS was updated earlier this month, several iPhone and iPad users have been unable to open Microsoft Word documents and many other file types in Apple's Files app for iOS 11 or iCloud Drive app for iOS 10. Instead, when users with the Google Drive app installed attempt to open a DOCX file in the Files or iCloud Drive apps, for example, the Google Drive app automatically opens and displays a prompt to save the file. MacRumors has been able to duplicate the issue, which is likely a Google Drive problem rather than a Files or iCloud Drive one. The only solution to the problem for now appears to be uninstalling the Google Drive app. Google has yet to comment on the matter, but it will presumably have to release another update to the Google Drive app to fix this issue. Update: The issue appears to be the result of Google registering for the "public.data" UTI and setting its handler rank to "owner." Then, the latest update to Google Drive seemingly added open-in-place support for "public.data," which is all data types, and became the default opener for many other file types. the default opener for every file format who’s owner does not support open in-place. A source familiar with the matter informed MacRumors that Google is aware of the issue and working on a fix. Update 2: Google Drive has been updated and no longer hijacks file opening duties in Files or iCloud Drive.